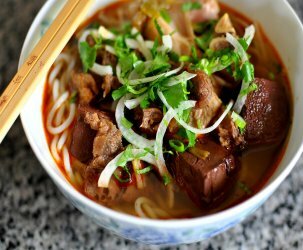 Bún Bò Huế – Yen Do is quickly becoming one of my favorite eateries in the city. 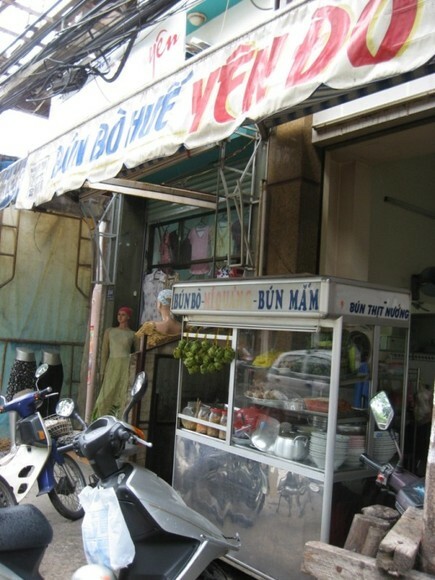 A short walk from the East Meets West office, Yen Do serves up cuisine from the city of Huế, which is regarded as the culinary capital of Vietnam and also the birthplace of my ong ngoai (grandpa). The restaurant is named after Huế‘s most famous dish—Bún Bò, which The Astronomer and I have yet to sample during our two visits. As per usual, we stumbled upon this restaurant hungrily during lunch time. 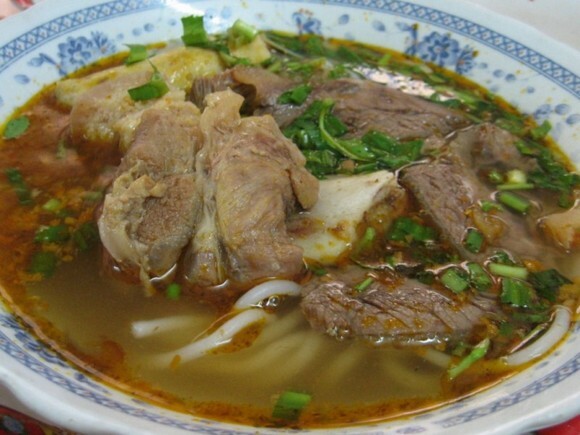 On both my first and second visits, I ordered a bowl of My Quang. My Quang‘s broth is orangey, mild, a bit sweet, a little spicy, and used sparingly in this uncharacteristically dry noodle dish. The noodles are wide like fettuccine and yellow due to the employment of turmeric or saffron. 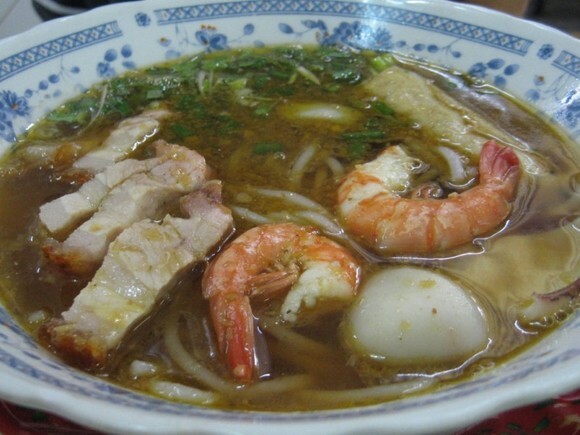 The yellow noodle trend seems to be unique to Vietnam because the My Quang I’ve had in the states uses regular rice noodles. Banh trang (sesame crackers), pork slivers, spring onions, peanuts, braised shrimp, and cha (pork forcemeat) add a variety of tastes and textures to this complex and hearty dish. 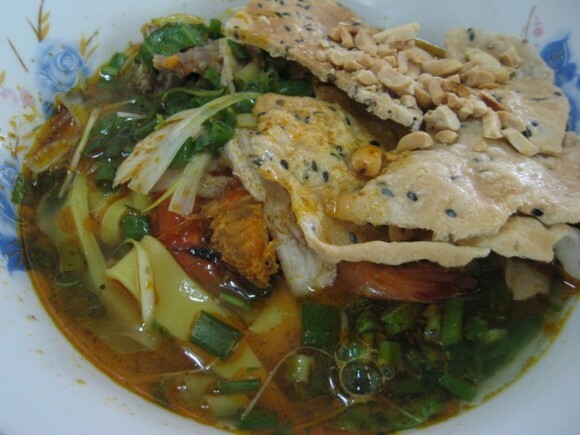 My Quang is served with a plate of fresh herbs; I like to add thin shavings of banana flower into my soup. I did not grow up eating My Quang and have probably had it twice in my life before coming to Vietnam, but I just can’t get enough of it these days. On The Astronomer’ first visit he ordered a bowl of Bun Mam, which he declared the best noodle and broth combination he’d had so far. The dish’s dominant flavor is fermented fish, which is oftentimes too strong for the untrained palate, including some Vietnamese folks, so I was very impressed that The Astronomer enjoyed it so much! 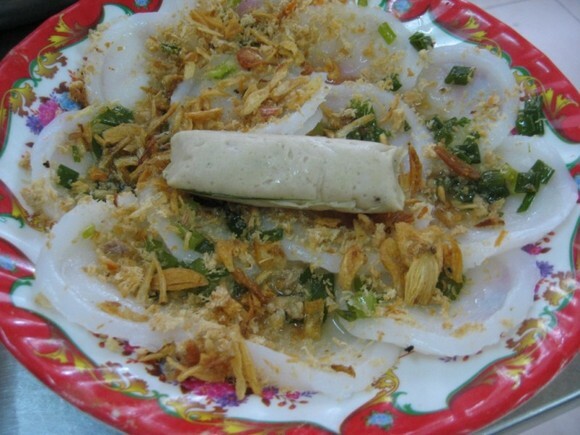 To supplement his noodles, he ordered a plate of banh beo, which are steamed rice and tapioca flour morsels topped with dried shrimp, mung bean paste, and eaten with sweetened fish sauce. 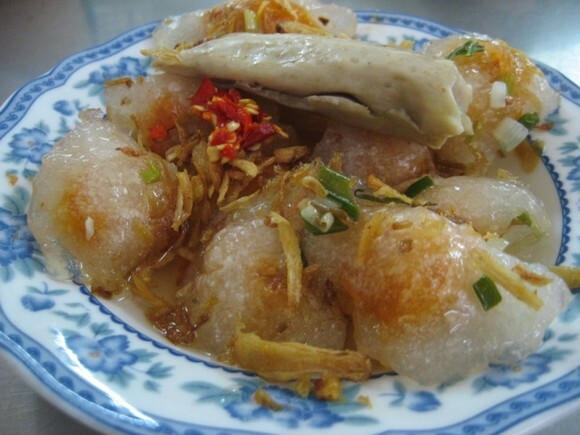 Banh beo is definitely one of The Astronomer’s favorite dishes. 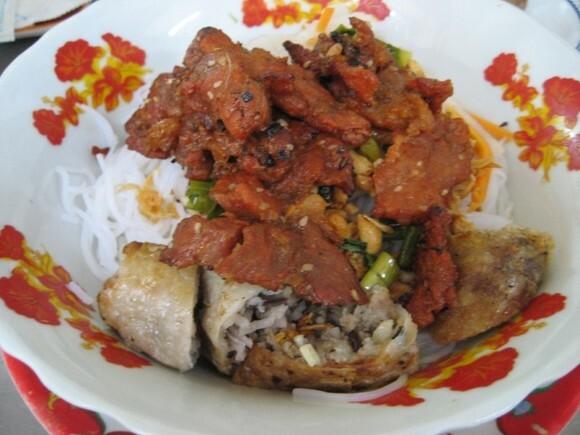 On his second visit, The Astronomer ordered bun thit nuong, which consists of vermicelli noodles topped with grilled pork, peanuts, bean sprouts, herbs, and fish sauce. The “chef” also added an eggroll for good measure. On these hot Saigon afternoons, bun thit nuong is a cool alternative to the regular broth and noodle dishes. Additionally, I ordered five eggrolls for us to share. The eggrolls were the best I’ve had thus far and the ratio of meat to wrapper was better than average. 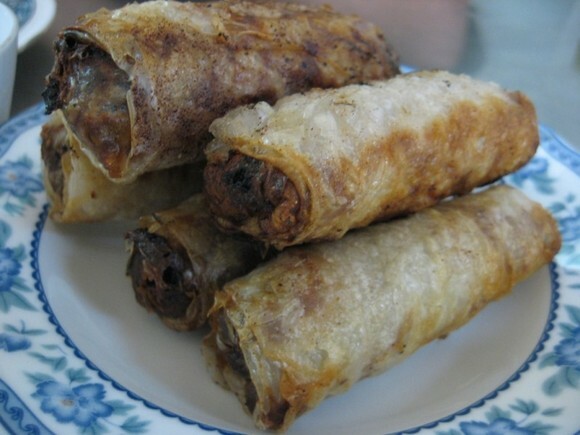 I have adopted the Vietnamese way of eating eggrolls, which involves wrapping them in lettuce leaves and dipping them in fish sauce. The flavors are really fabulous. UPDATE: My aunt Phoung came to Saigon last week from San Diego and I took her to Yen Do for lunch one day. We ordered a plate of banh bot loc and they were awesome. I hate to admit it, but they were even better than my grandma’s! Most of the time, the overly-chewy texture of banh bot loc makes me choke, but these were pleasantly chewy. 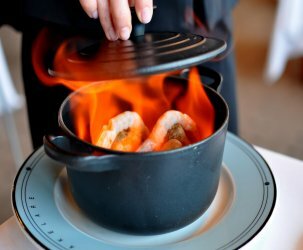 UPDATE II: The restaurant’s signature dish was quite good. The gio heo tasted just like home. I agree. I once eat in a Boston restaurant. I have to wait an hour to be seated and the food is so bad that I want to throw up. 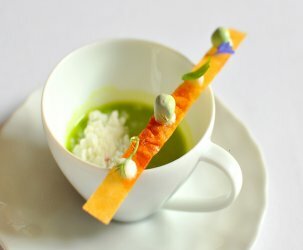 Also the reason is that cooking Viet food is about experience. Because the seasoning are so diverse and Viet food use a lot of contradictive flavor in the same dish that if the chef are not skilled at adjusting to the varied seasoning, the food will come out really badly. Just having a Viet recipe does not make one a Viet chef.